The US Navy's fleet of heavily-armed SSGN subs will run through their nuclear fuel supplies by 2026. At that point, they must be replaced at a cost of $8 billion apiece. Problem is, $8 billion is roughly half of the Navy's annual ship production budget. So what's the Navy to do? 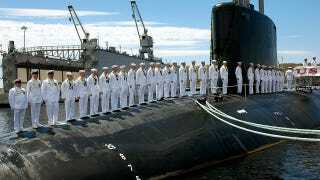 It plans to stretch—literally—its Virginia-class attack submarines by an extra 94 feet to store 26 extra missiles (for a total of 40) and outfit them with an advanced sensory suite—at a quarter the cost of a new SSGN, just $2 billion apiece. Sure the SSGN carries 154 Tomahawks apiece, but there are only four SSGN's in the US fleet—compared to the 10 Virginia-class available. This modification will help spread the fleet's firepower out more evenly.